We are tickled pink (and purple, blue, green and every color of the rainbow) to present our "Room-In-A-Box" product series to you. Each product grouping features one beautifully soft mosquito net bed canopy, one hanging lamp, and one beaded curtain. They have been specifically chosen to look adorable together. You'll save some scratch too, as we've discounted the bundled price off of what they would be if you purchased each item separately. 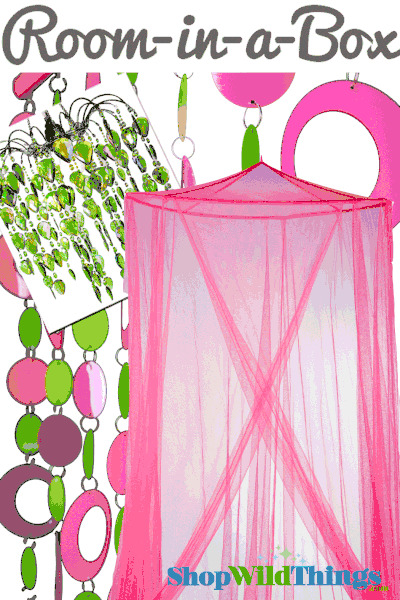 This wonderful Room-In-A-Box includes one of each: "Megan" Fuchsia Pink Canopy, Hoops Pink N' Lime PVC Beaded Curtain and "Fountain" Lime Green Chandelier "Megan" Canopy: Mosquito Net Canopies are fantastic for adding visual interest to any space. 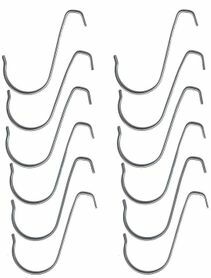 They look great over beds, outdoors, in playrooms, around cake tables at a wedding or event...the uses are positively endless! Our supreme net canopy fabric is soft as can be, making it a luxurious addition to your decorating scheme. Just hang it up and in minutes you'll add class, glamour, and the illusion of added height to any room. Our "Megan" bed canopy is one solid color of sheer fabric netting. They look simple and elegant as they are, but you can even take it a step further and add strands of beads or flowers around the top to make it match your room. Just use fabric adhesive or jump rings to attach beads! 100% Polyester Netting-Fuchsia Pink, top folding metal ring 2' Diameter, x 8.2' Long x 39.4' Fabric Circumference. Canopy mounting hardware included. 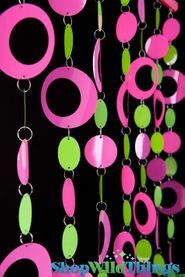 "Hoops Pink N" Lime" Beaded Curtain: This new curtain is TOO CUTE! The circles are made of PVC which in this case is made into a sturdy but flexible disc. There are 7 strands attached to one pink rod. It measures 35" wide by 78" long. Totally cool to cover the walls with or put in the windows! The pink hoops are big, they measure about 4" and the lime circles are about 2.5". You can make this curtain longer by purchasing extra curtains and attaching the extra strands. "Fountain" Lime Green Chandelier: Your "Fountain" Chandelier does not include a light kit but if you do want an electrical cord that fits this chandelier, please see our Light Cord Kit. The beads are Green with an Iridescent Coating with also reflects pink! The chandelier size is 12" in diameter, 13" Bead Length.